The First Ever Satellite Winner -- Tom McEvoy! In 1983, the World Series of Poker grew once again to 108 players, which was stretching the physical limits of Binion’s Horseshoe. The advent of satellite tournaments were allowing more players to qualify and compete for the world championship. The idea was dreamed up by Eric Drache, who spied a group of players in a cash game playing with just about $1,000 each. He suggested they play a single-table freezeout for a main event buy in, they obliged, and the satellite tournament was born. Many of the preliminary events were crowded that year, as well, especially the $1,000 Omaha event (won by David Sklansky in 1983). The game of Omaha had seen a huge rush of popularity in Europe, and the Binions decided to add it to the lineup to keep European players coming to Vegas each summer. The experiment worked, as nine Irish players alone were present at the Horseshoe that year. Thanks to the influx of amateur players that satellite tournaments flooded the field with, the main event in 1983 marked a historic shift. For the first time since the event’s inception, there were more amateurs in the field than professionals. The event was also beginning to attract high-profile celebrities from other walks of life. Larry Flynt made his first appearance in the world championship that year, and he made a lot of noise before he was eliminated in 12th place. The amateur movement would explode in years to come, which made it harder and harder for professional players to win. It wasn’t enough anymore for a player to be one of the best, they also had to be lucky to become a world champion. One such player who won his way into the event via satellite was Tom McEvoy, a middle-limit grinder looking to make a big score. He was playing well that year and had already won a bracelet in the $1,000 limit hold’em preliminary event. He was also among the chip leaders when the final table began in the main event. The final table in 1983 followed the suit of the year before, as the first seven players hit the rail very quickly on the way to heads-up action, but that is where the similarities ended. In just over 20 minutes, George Huber (ninth), R.R. Penington (eighth), Austin Squatty (seventh), Donnacha O’Dea (sixth), Robbie Geers (fifth), and Carl McKelvey (fourth) were all sent to the rail. The final three players had taken turns disposing of that unfortunate half-dozen. 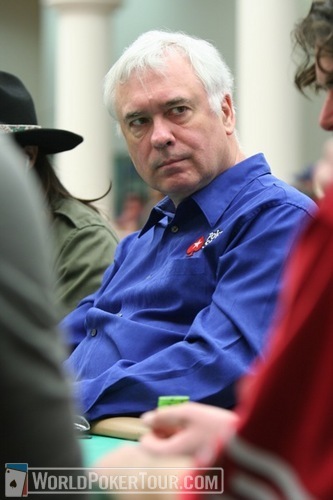 Doyle Brunson was the favorite to win his third world championship with three players remaining, but he ran into the set of another satellite winner, Rod Peate. Brunson moved all in for 267,000 on a flop that gave him top pair and a flush draw with Jd 9d in the hole. The 9 on the table that gave Brunson top pair on the board had also given his opponent a set of nines, though. Brunson was eliminated on the hand, leaving it to Peate and McEvoy to play for the biggest win of their lives up to that point. Peate began the heads-up match with a 3-2 chip advantage thanks to the chips he relieved Brunson of on Brunson’s final hand. Peate attacked McEvoy aggressively from the beginning of the match and pushed his lead to 4-1 at its height. Even with the chips stacked against him, McEvoy refused to give up and just tightened up even further on the short stack. He waited only for the largest of hands, and the match stretched on for seven hours, as well as a fifth day of competition (a main-event first) as McEvoy inched his way back into contention. He accomplished his goal with this strategy and eventually recaptured the chip lead. Just before 2 a.m., McEvoy opened a pot with a 20,000 raise and Peate looked down at K J before reraising to 40,000. McEvoy held pocket queens and decided to move all in with his strong holecards. Peate made the all-in call, and they exposed their cards. The board was dealt 6 6 3 J 3 , and McEvoy was a world champion, as well as the first satellite winner to parlay his small entry fee into larger riches (minus a large chunk that went to his backers). Mike Sexton said after the event that while McEvoy’s tight strategy helped him win, it also “set poker back at least 10 years.” His statement proved correct, considering that four television networks were present to film the action in 1983, including NBC, CBS, ABC, and one Canadian outlet. None of them returned the following year.